The design of the school is centered around the concept of immersion // emersion. Embodied most readily by the Farmstead - Roots & Wings is a school where one finds their place with the Earth (immersion), but also from which to expand and grow from it (emersion). Based on the Montessori principles of ‘discovery,’ in which students learn concepts from working with materials, the organization of the school into three places emphasizes a diversity and tailoring of experience: Main Building // Discovery Wing // The Yard. The landscape and buildings of the Farmstead will be a place where any child has the freedom to grow into the person they are intended to be, in a constant environment of wonder and self-discovery. The design of Roots & Wings allows a variety of places based on Montessori principles where students learn to ground themselves through immersion while letting themselves grow and expand through emersion. Spaces are arranged to allow freedom of movement around, between, and through various activity areas. A continuous and central circulation spine connects both buildings. Programmed spaces are located off of this circulation spine, with secondary circulation around these spaces. A primary grid was established to allow for an ordered sequence of structure and spaces. Columns provide a sequential rhythm to the spaces, and this grid informed the design of the main spaces of the school, which resulted in a semi-symmetrical layout. The school was designed as a harmonious instantiation of three distinct, but related spaces. 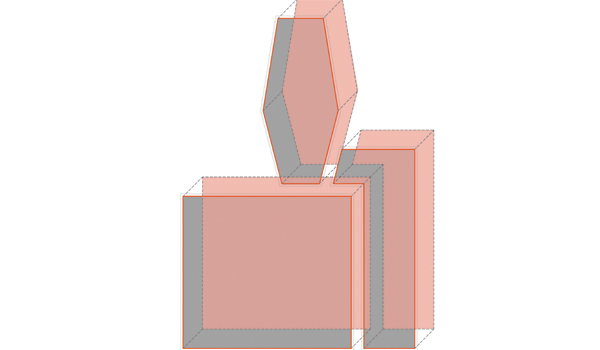 The spaces intersect uniquely to create a composition of elements that relate through interactions of mass / void, addition / subtraction, and linear / spatial. 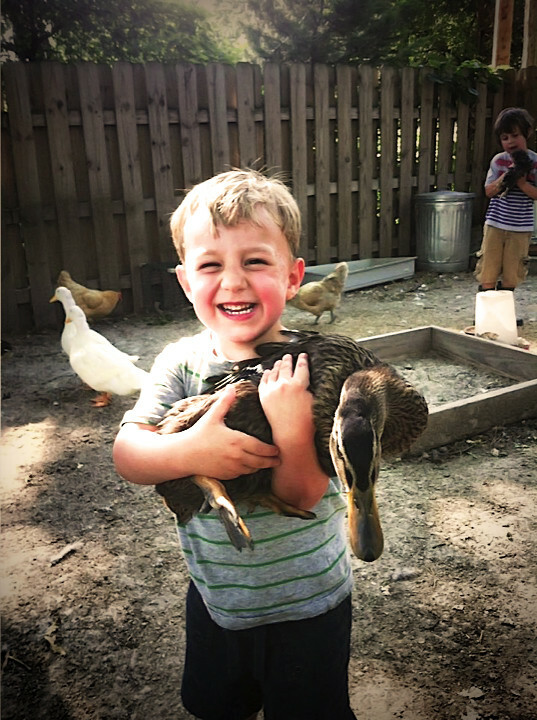 As a farming Montessori school, Roots & Wings encourages a mutualism with nature for self-sustenance. The school operates similarly. Plants literally grow on the school, with a network of hanging gardens producing food. The building also is a tool to teach sustainability, its passive systems serve as a learning device for young students. 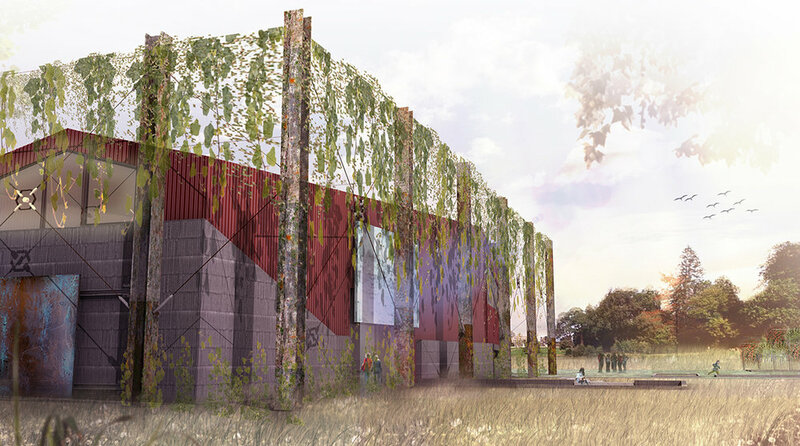 Roots & Wings will be located in what we are calling ‘The Clearing,’ which is an open patch of land on a larger property adjacent to South 59th Street. Phase I includes the Main House, Discovery Wing, The Yard, and Entrance Access & Parking. Phase II includes refurbishing of the historic barn as a large multi-purpose space. Phase II also includes the construction of a new greenhouse accessible from the main school buildings. The greenhouse will be oriented to match the barn, which will also provide maximum efficiency for light and solar gain. Phase III includes larger site work in a large meadow we are calling ‘The Extension,’ which is a place for extended larger activities in nature, such as additional farming areas, camping areas, Hillside Vista, and hiking and nature trails. 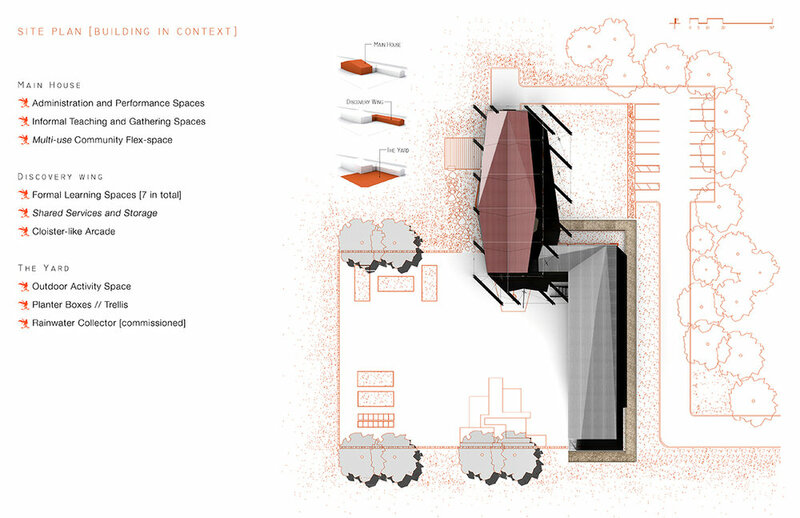 MAIN HOUSE: Administration and Activity Spaces surrounded by and embedded within informal teaching and gathering spaces. The Main House will also include a multiple use shared space and a large flexible community space. DISCOVERY WING: More formal and efficient learning spaces (classrooms) - 7 in total. These classrooms will utilize shared services and storage. The Discovery Wing will feature a cloister-like arcade that opens directly onto the Yard. THE YARD: Outdoor activities that include versatile learning possibilities for working with nature. The Yard will also include a featured gathering focal point (such as a fountain or well), and different opportunities for growing plants, vegetables, and fruit. The Yard is a formalized courtyard space within the larger clearing that forms the identity of the school in which the remainder of the building surrounds. The Main House is designed as two Administration and Activity Spaces surrounded by and embedded within informal teaching and gathering spaces. These admin, faculty, and secondary spaces are shells within a larger perimeter shell, and are therefore separated from the exterior of the building by circulation spaces. 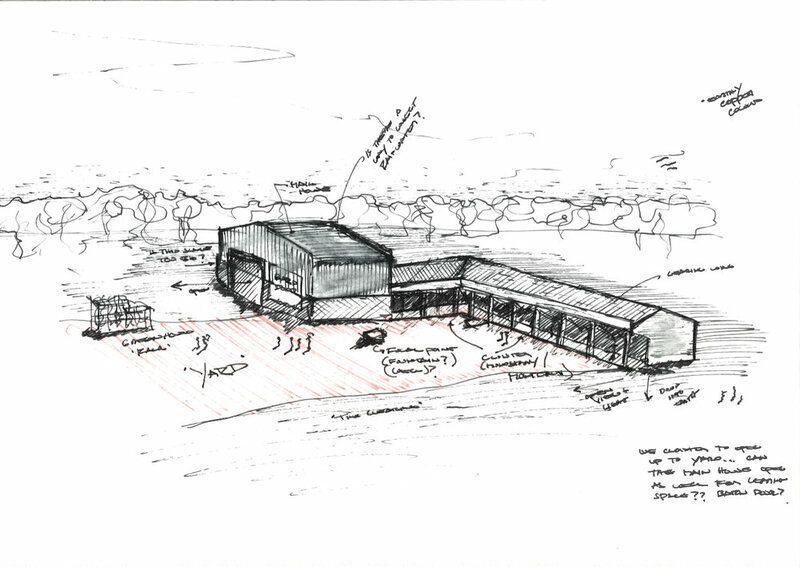 The Main House will includes a multiple use shared space and a large flexible community space, which has a large opening with a sliding insulated barn door that expands to be both indoor // outdoor. The Discovery Wing is organized so that youngest students are located furthest away from the Main House, and older kids closest. Ages, therefore, are separated by classrooms, controlling noise throughout the building. Classrooms share services such as WC and Storage. 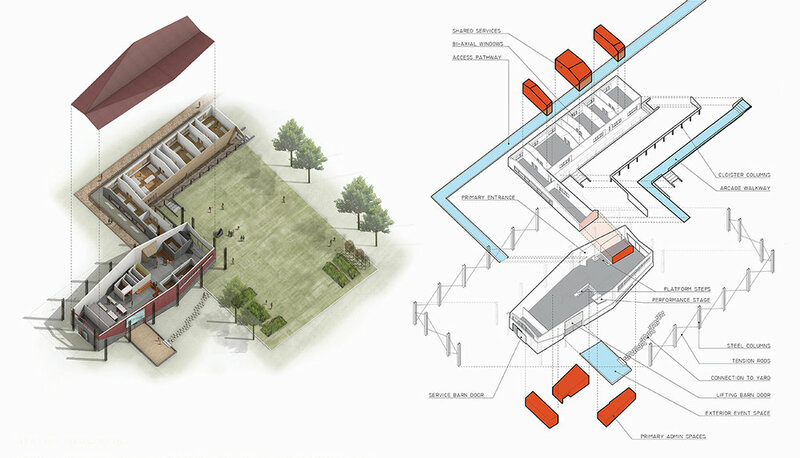 The design of the school opens up toward ‘The Clearing’ through expandable spaces. While the main public entrance to the school is on the east side facing the road, the design of the building is meant to focus toward the west. Rather than open up to the street, the design of the school embraces nature and the forest. The Main House has a large opening with a sliding insulated barn door that offers an expandable flexible space that can be both indoor // outdoor. The Discovery Wing has a open courtyard cloister that provide immediate access to the Yard. Moreover, the yard faces toward the south and west to gather sunlight and warmth for growing plants & vegetables. The school is oriented along an offset North/South axis. This design blocks much of the intense south heat during summer, while allowing ambient light during teaching hours. The Main House has two retractable barn doors that close to block harsh southwest sunlight in the late afternoons after lunch. These barn doors are highly insulated, which reduces the amount of heat loss while closed during the winter months. The Main House is semi-enclosed by a secondary superstructure shell of plants and vegetables, which serves as the structure for the building and features a vertical garden filtering light entering the school. The design of the school offers an integration between exterior outdoor space and interior spaces. The school has two primary adjacent outdoor spaces: the exterior event space and The Yard. These spaces are connected by an outdoor stone walking path. The school has two semi-outdoor spaces that offer a direct connection to the outside. These interstitial spaces are adjacent to the primary functions in the school: event space and classrooms. There are multiple places for the growth of plants and vegetables: The Yard has five large vegetable gardens and a vertical lattice garden on the southwest corner. There are six large fruit trees planted in pairs. Finally, the superstructure of the Main House can also be used as a vertical garden to grow plants and vegetables. The Main House has a retractable barn door that closes to block harsh southwest sunlight in the late afternoons after lunch and has a high window with vertical fins to allow views of the sky while blocking the sun. The Discovery Wing has an overhang that blocks direct sunlight and rotated east facing windows to block light in the morning. Finally, the vertical garden over the Main House filters and provides a green hue to light entering the house. The roof of the Main House is designed to capture the maximum amount of rainwater without appearing as a butterfly roof. This water is directed by the natural slope of the roof into a water collection tube, which filters and releases the rainwater into a collecting cistern. This cistern, which is a sculptural element commissioned by a local artist, is on axis with the Main House and the stairs into the Yard from the Discovery Wing. The Main House serves as a double-height primary space of the building. Enclosing the Main House is an externalized super-structure that frames the building, which supports the building and features a vertical garden filtering light entering the windows. The ceiling of the Main House provides a formal element with steel beams line the unique valleys of the roof. In contrast with the ceiling, walls are kept clean and simple, with the exception of seating nooks and informal meeting spaces. The space is finished with a tiered platform stair that serves as seating for presentations and other gatherings. These steps connect to a built in stage, that is both an eating area and performance space. The parking arrangement minimizes site impact through the reduction of paving material and tree removal at that location, while allowing direct entry into the building and service access. The parking spaces are made of permeable pavers to allow water to penetrate the service and be naturally filtered by the Earth.